To travel across the Arctic and back, watch whales and polar bears, see eternal ice fall into the ocean, encounter ancient Inuit – all from your own living room, but as if you were there. Virtual reality (VR) makes it possible. With Polar Sea 360° (2014) the German-French network Arte produced a VR experience that feels like television of the future. 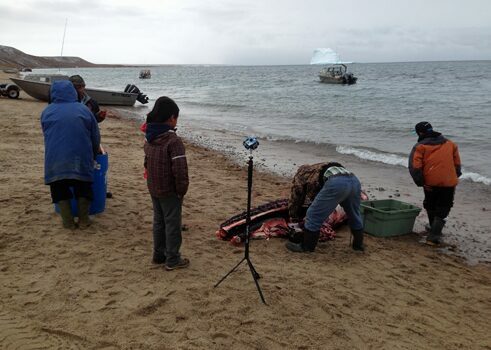 The project presents a multimedia research expedition through water, ice and snow. In the documentary Polar Sea – Die Eroberung der Nordwestpassage (The Conquest of the Northwest Passage), Tanja Dammertz and Kevin McMahon follow the traces of the disastrous nineteenth century polar expedition of Admiral John Franklin. A ten-part documentary series Per Anhalter durch die Arktis (Hitchhiking through the Arctic), also by Kevin McMahon, shows the impact of climate change in the region today. The linear TV feature is complemented by an interactive extension: an all-round 360-degree view that virtually beams viewers to the Arctic, giving them the opportunity to take a look around themselves. The experience was originally designed fot the Oculus Rift headmounted display. 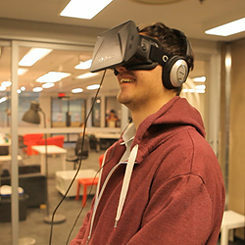 Since at the time of production the Oculus was not yet on the market the 360-degree video was also made accessible for smartphones through the use of a simple cardboard frame. Thomas Wallner | © Deep Inc “Arte wanted to sensitize people to climate change in a special way,” explains filmmaker Thomas Wallner, who created the 360-degree film. “They should be able to experience the changes in the climate themselves, instead of just being told about it.” What is 360°film and how is it made? It focuses on the ability to film the world from every direction. The resulting spherical film initially looks like a conventional film with moving images and sound, but with one big difference: Instead of sitting in front of a rectangular screen you are in a seamless sphere. The media user can look in all directions and independently explore the virtual world. “Everyone who has the experience immediately recognizes the creative potential of this new way of portraying reality,” says Wallner. When Wallner started the Arte project in 2011, the television editors had the idea of creating 360-degree panoramas for web browsers. Shortly thereafter, when the first prototypes of Oculus Rift were introduced, they wanted to work with Virtual Reality. There were only a few service providers for the production of spherical films, however. Equipment, shooting and post production were prohibitively expensive. Wallner therefore decided to experiment and search for ways to produce 360-degree videos quickly and cost-effectively. Two technological innovations brought about the breakthrough: the 3D printer and the small GoPro camera. With a 3D printer special rigs could be produced on which several GoPros could be mounted in a circle. The low weight of the cameras and their ability to record images without being directly connected to a computer made it possible to mount spherically arranged camera sets on drones and to film HD panoramas in flight. Polar Sea Director Thomas Wallner and 360 drone flyer Ian Hannah mount a 360 camera on a chopper to capture images of the Canadian Northwest Passage. Polar Sea Director Thomas Wallner mounts a 360 camera on a chopper to capture images of the Canadian Northwest Passage. The filming took place in Pond Inlet in the Canadian Arctic. They soon realized that the GoPros were quite sensitive. “If one of the six cameras fails during a panorama shot, the entire take is lost,” explains Wallner. There were more difficulties to overcome. Since the cameras film in all directions, the crew had to try to make themselves as invisible as possible. In order not to be seen in the barren icy landscape, the filmmakers wore camouflage suits or hid themselves in suitable locations if they could find any up in the ice. “Pretty soon we had a new routine,” says Wallner with a grin, “Camera’s running: Duck!” Since there was no wireless monitor system, the work was done flying blind. Even after the shooting was over, the crew could not immediately see the shots, because it took too long to transform the footage from the cameras into a sphere. The VR piece for POLAR SEA 360° has been made not only to show the Arctic, but also to convey a message. This raised the question of the appropriate film language. How can the viewer’s attention be steered? How should camera shots, cuts, scene changes be done? How can a focus be put on characters? “It works very differently from cinema,” explains Wallner. “Virtual Reality breaks through the fourth wall.” The user is in the middle of the action looking at the world from the inside out. While viewers of 2D or 3D movies look at the characters and can project their own desires and feelings onto them that is not possible in VR. 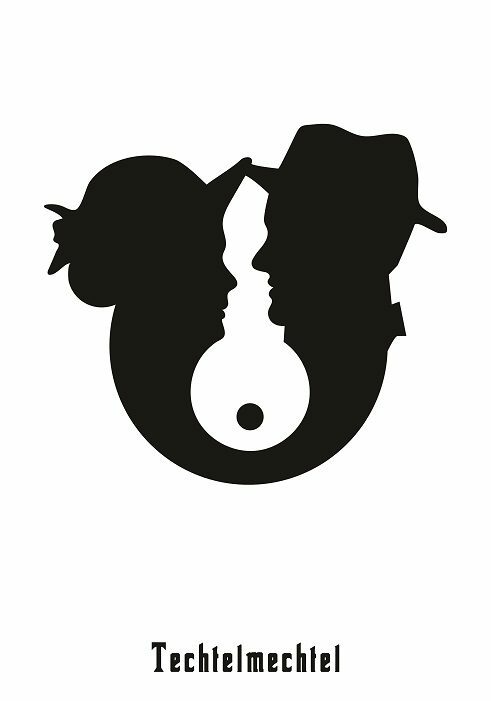 What does the person in the centre of the sphere, the user, represent? What role does she play? The juxtaposition of contrasting images, which has been part of cinematic grammar since the invention of film editing, would only cause confusion in VR. While the full scope of a film narrative is only assembled in the mind of the viewer, who connects the dots between the images she gets to see, this is not possible in VR. The new medium directly addresses the senses. Rather than using a symbolic formal language, as all other media do, VR provides an immediate experience that requires neither a temporary suspension of disbelief nor an act of interpretation by the user. Ryerson University test subject watches the Polar Sea trailer for the first time in VR | © Deep Inc Experiencing the illusion of presence can quickly cause dizziness or nausea. POLAR SEA 360° avoids this problem by allowing users to either explore the virtual world from a fixed point of view or to use a fixed object for orientation such as a helicopter during panning shots. Instead of film cuts, POLAR SEA 360° works with smooth crossfades so that users can experience day and night as well as different seasons in the Arctic within the scope of a few minutes. The soundtrack draws attention to protagonists who appear as if in a dream and tell a story. Special software made it possible to embed documentary sequences in the 360-degree panoramas.